Pelican Deitanseki Clay and Charcoal bar is a facial cleanser that is made from natural ingredients. It is made in Japan and is suitable for all skin types, which is formulated for everyday use. Kaolin clay and carbon powder gently cleanse skin and lather to draw the impurities out from the pores. It also contains Bentonite which should help your skin retain its natural moisture. There is a couple of ladies that use this soap for their body as well as their face and some that even use it on their hair. They say it makes it soft and shiny. Soap Base, Water, Tetrasodium Edta, Etidronic Acid, Peg-75, Glycerin, Chacoal Powder, Papain, Bentonite, Kaolin, Fragrance, Titanium 3 Dioxide. Using warm water lather the soap in your hands, then gently massage it onto your face, then rinse. This Japanese soap cleanser has proved very popular with users. They relish how it reduces oil, thus helping reduce acne breakouts. The only complaint I found was that it is hard to get hold of in the states. I think this cleanser is very reasonably priced at $10 for a 5.3 oz bar. Dermalogica Age Smart Skin Resurfacing Cleanser is formulated to get rid of dull skin cells on the surface of the face and leave a more youthful glow. Its a cleanser and exfoliant in one. This anti-aging cleanser is suitable for all skin types. It contains antioxidant vitamin E which promote softness and also fortify s the skins natural moisture barrier. The Rose flower oil helps to calm the skins sensitivity, so that should make Age Smart gentle enough for everyday use even on sensitive skin. Rinse face with warm water, lather cleanser in hands then apply to face and neck, massage for about a minute then rinse. Use gentle circular motions on the face and upward sweeps on the neck. Water (Aqua), Sodium Laureth Sulfate, Lactic Acid, PPG-2 Hydroxyethyl Cocamide, Cocamidopropyl Betaine, Glyceryl Stearate SE, Polyacrylate-1 Crosspolymer, Tocopheryl Acetate, Titanium Dioxide, Sodium Hydroxide, Disodium EDTA, Benzyl PCA, Phenoxyethanol, Butylene Glycol, Citral, Citronellol, Eugenol, Farnesol, Geraniol, Hydroxycitronellal, Isoeugenol, Limonene, Linalool, Acorus Calamus, Aniba Rosaeodora (Rosewood) Wood Oil, ,Eugenia Caryophyllus (Clove) Flower Oil, Helianthus Annuus (Sunflower) Seed Oil, Pelargonium Graveolens Flower Oil, Rose Flower Oil, CitrusMedica Limonum (Lemon) Peel Oil/Extract, Caprylic/Capric Triglyceride. This product seems to have acquired a fan base in women 40+. They say it has taken years off their skin, as well as exfoliating deep into the pores. I haven't come across any disappointed customers that have used this cleanser yet. If you want to try Dermalogica Smart Skin Resurfacing cleanser it costs around $35 for a 5.1oz bottle. A reasonable price for a 2-in-1 cleanser and exfoliant. Borghese Crema Saponetta Cleansing crème is designed to clean deep down into the pores, removing makeup, pollutants and dead cells that clog the pores. This Cleanser activates when combined with water, it should lather and dissolve any surface debris. The Chamomile and Rosewood was added to the formula to help prevent irritation, they also help soothe and reduce any inflammation. It also contains Geranium and Cypress, which are supposed to stop skin from drying out, stimulate and tone. This cleanser has a thicker creamy consistency than most others on the market, so may feel a little heavy to start with, but will thin out and lather when water is added. Aqua (Water), Myristic Acid, Glycerin, Palmitic Acid, Stearic Acid, Potassium Hydroxide, Triethanolamine, Stearamide MEA Stearate, Fragrance (Parfum), Sea Salt (Maris Sal), Hydrolyzed Collagen, Hyaluronic Acid, Collagen Amino Acids, Adenosine Triphosphate, Mineral Salts, Pentadecalactone, Magnesium Aluminum Silicate, Propylene Glycol, Dipropylene Glycol, Phenoxyethanol, Methylparaben, Propylparaben, Yellow 5 (CI 19140), Blue 1 (CI 42090), Red 4 (CI 14700), Citronellol, Geraniol, Limonene, Linalool. Wet skin with warm water, then massage a small amount of cleanser onto the face and neck, avoid the eye area, then rinse. Patrons of Borghese seems to find it favorable. They liked how it helped clear acne and that it left their skin feeling so soft. However, a couple of ladies found that it didn't remove their makeup, therefor they had to buy a separate makeup remover. Personally I would it expect it to remove makeup and every little spec of dirt considering it can cost up to $32.50 for a 6.7oz bottle, else it is not worth the money! I personally love Lush products because all the ingredients are natural and it smells so good. Whenever I walk in to one of the stores I feel like a kid walking into a sweet shop. 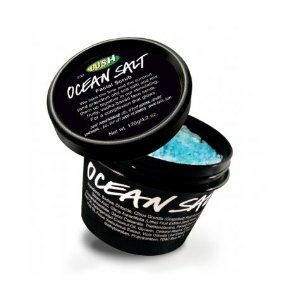 Ocean Salt Cleanser By Lush is an all over body scrub containing ocean salt designed to scrub away dirt and dead cells, leaving skin softer and brighter. It should have a lovely violet and lime scent. Coconut and avocado butter help soften the skin, while lime and grapefruit juices revitalize. Containing acidic fruit juices can sometimes be irritating to people with sensitive skin. However, while all these ingredients are beneficial when exfoliating, they can be quite drying to the skin. So just to sure to moisturize after. Lush's body scrub has proved to be very popular among users, none of them had a bad word to say about it. They liked how it left their skin feeling so smooth and even though it is quite pricey at $18.55- $32.95, although, all the reviewers I found said it was worth the price. I love these Japanese product lines. They are always so different, it's so good how they are usually always made out of such raw natural ingredients. 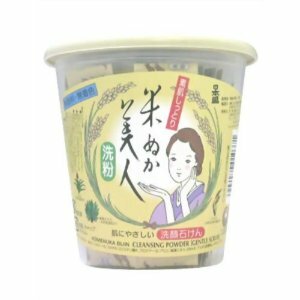 Komenuka Bijin Facial Cleansing Powder is made from natural rice bran. It is so strange that it starts off as a powder, then by adding water it becomes a creamy cleanser. A lot of beauty guru's canonize the distinguished packaging, it comes in powder form in little sachets so is ideal for traveling. There is about 30 sachets and you should be able to get 3 washes out of each, pretty good. This product promises a lot of things but does it deliver on those promises? I can't actually find a bad word said about it. Users love how it leaves skin feeling soft, clean, controls oil, helps prevent acne breakouts, the soothing feel, how its non irritating and good for travel. Wet face with warm water, then pour 1/3 of the powder into your hand, add water to it, rub hands together to create emulsion, massage into face and rinse. Rice Bran Extract, Sorbital, Aloe Extract, Algae Extract, Potassium Dna, Dehydroacetic Acid, Paraben, Potassium, Myristate, Protease. , Rice Oil, Coconut Oil, Seaweed, Ginseng, Aloe, Wheat Powder, Swertia Herb. This is a big hit for everyone who has used it so far. I don't know about you but I'm excited to give this a try! The price is quite extravagant at $36. However, it should last a while and according to users it actually works! Beautyblender Season Of Love Blender Sponge & Cleanser Kit includes 2 makeup sponge applicators and the cleanser to clean them. A lot of dirt and oil builds up on makeup sponges so it needs to be cleaned thoroughly. If its not clean the dirt will just be transferred back onto the skin. The cleanser has a light lavender scent and is free from dyes and skin irritants. The sponge helps to blend makeup for a flawless look. The life of a sponge is about three months. Users of Beautyblender have nothing but good things to say about it. They love that the sponge gives them such flawless coverage and how easy it is to use. One lady says how it is definitely worth the higher price. Deionized Water, Vegetable-based Cleansing And Sudsing Agents, Mild Surfactants, Emulsifiers, Fragrance. The Beautyblender kit costs $39.95. A bit over priced if you ask me, it's only a couple of sponges and cleaner! You are currently browsing the archives for the Cleansers category.